Diageo’s global Scotch whisky master has been in the industry for 20 years, promoting Scotch on almost every continent. He tells Matt Evans about the secret of how to deal with jet lag, grain whisky’s bright future and star-studded dinners with Posh and Becks. ‘A moment of my whisky career that still stands out today was the Haig Club London event we hosted a few years ago. We took over the Wellington Arch and created a pop-up restaurant with Brett Graham, the double Michelin-starred chef at The Ledbury, and we created some incredible dishes paired with single grain cocktails. I looked around the table and David and Victoria Beckham were there, Tom Cruise was there, Guy Ritchie, Idris Elba, Kate Walsh… it was star-studded. I don’t think I’ll ever forget that. ‘I’ve worked in the Scotch industry for 20 years. My first job after university was at Cadenhead, who used to have me go and work in the Springbank distillery, which was cool because I was able to build an appreciation for every element of whisky production. I moved on to Angus Dundee distillers, and in 2004 I moved to Bacardi, working as the US brand ambassador for Dewar’s in New York. In early 2011 I joined Diageo and now hold the position of global whisky master. ‘Day-to-day, I head up the global Scotch ambassador team, mentoring the next generation of whisky ambassadors. The other part of my role is the global whisky master for Haig Club, and I have the pleasure of working with David Beckham for launch events and press conferences around the world. Lastly, I manage a few smaller projects for Diageo, for example the malt whisky flavour map [created by Diageo and Scotchwhisky.com’s Dave Broom]. So it kind of ticks all the boxes for “best job in the world”, but it involves a lot of international travel. ‘One of the beautiful things about Scotch is that it’s already sold in nearly every country in the world. We’ve seen impressive growth in Asia and particularly China, but the new market that stands out to me is South Africa. I’ve had the good fortune to travel there a lot for the launch of Clubman, and there’s a real increased interest in Scotch there. They love it. I think there’s an aspirational element at play, but lighter, more “mixable” whiskies are helping to change the category’s perception. ‘Scotch has always been popular in New York and London – and in those cities, I’m starting to see it dominate cocktail lists. For us to convert new drinkers, the key is to get as far away as possible from the snobbery and pretentiousness, and one of the simplest ways of breaking down that wall is to introduce people to great mixed drinks and cocktails. Drinking Scotch should be a fun thing to do. ‘Grain whiskies have been in the industry for a long time, and one thing I’m aware of is how adored single grain Scotch is by experts. 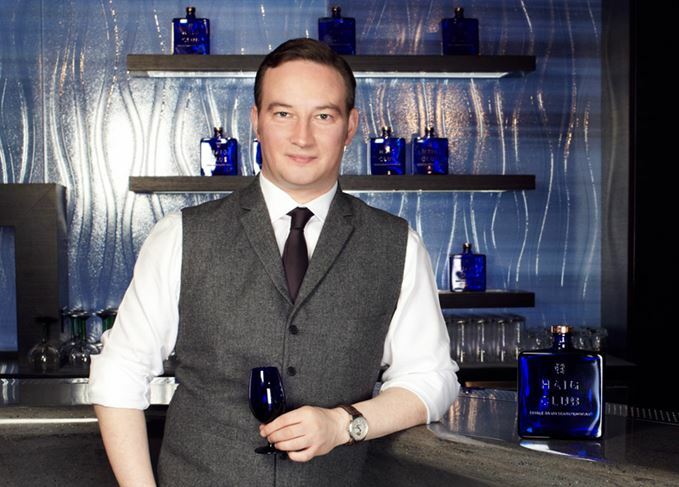 The Haig Club master blender, a chap called Chris Clark, is a man I consider to be one of the world’s leading experts on single grain Scotch maturation. He’s been working with single grain for 30 years, and when you’re maturing and bottling a single grain, there’s nowhere to hide. You’re working with a really light, subtle spirit, so the maturation is really important. I think that industry appreciation is starting to cascade into the wider world, and it’s an exciting time for single grain. ‘The involvement of celebrity partners does vary from company to company, so I can only speak to my experience. But with Haig Club, David Beckham spent a considerable amount of time with our blenders, distillers and maturation specialists. He spent time with us in Scotland as we developed the liquid and the packaging. And when we bring it to market and go to launch, the impact he has is phenomenal. So he’s heavily involved in every part of the process. ‘The advent of social media has been great for both brand ambassadors and fans of Scotch alike. We’re here to help people fall in love with Scotch, and that means sharing a combination of knowledge and passion. I don’t see that changing any time soon. But with social media, fans of whisky can access this from all over the world. People no longer need to read a magazine article or attend a masterclass to learn new things. It hasn’t changed our goals, but it has changed how we achieve them. The single grain Scotch launched by the footballer will be joined by a new expression this month. Diageo readies a new single grain launch, continuing its tie-in with the former England captain. Dave Broom grapples with grains, including Caledonian, Haig Club Clubman and Port Dundas. The first permanent venue dedicated to the brand offers more than 20 cocktails. The new advert for Haig Club Clubman has the authority and reach to change perceptions of Scotch.